One of the world’s most iconic sporting venues, La Manga Club continues to set the pace for sports and leisure destinations across the globe after the Spanish resort claimed two top accolades at the 2018 World Travel Awards– including being named ‘Europe’s Leading Sports Resort’ for the first time. The famous Murcian venue received the coveted honour at the event’s European gala ceremony in Athens, Greece, and the resort capped off a memorable evening when its five-star Hotel Principe Felipe was crowned ‘Europe’s Leading Luxury Resort & Villas 2018’ for the second year running. Recognised globally as the ultimate hallmark of quality, the awards are regarded as ‘the Oscars of the travel industry’ and are voted for by travel and tourism professionals and business and leisure travel consumers worldwide. Hundreds of the leading figures of Europe’s travel and tourism industry attended the 25th edition of the awards at Athens’ historic Zappeion Megaron Hall, with La Manga Club recognised for its long-term commitment to delivering the best possible customer experience across a wide range of sports and leisure facilities. In addition to opening a new children’s playground, multi-sports court and ‘The Village’ café and bar in the resort’s Las Lomas Village, other recent upgrades have included the opening and revival of the Piano Bar in the hotel and a new European Cricket Performance Centre, while the resort opened a new Chelsea FC Foundation Soccer School this year – the first of its kind in Spain. Nick Montgomery, general manager of La Manga Club’s hotel, spa and food and beverage divisions, said: “Here at La Manga Club, we pride ourselves on offering the very best facilities and service to our guests and it’s fantastic that this has been acknowledged with these two top awards. 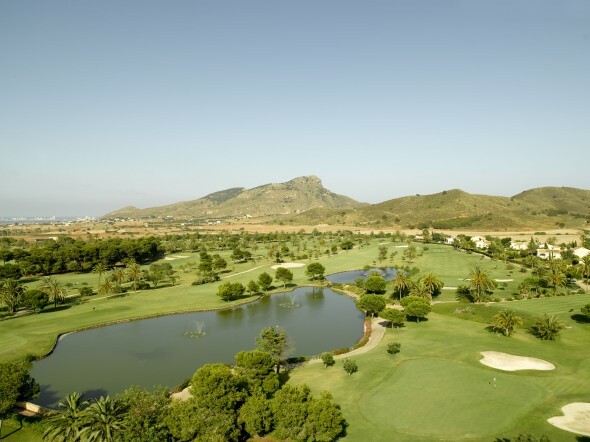 La Manga Club has enjoyed another remarkable year of success which has featured a number of other leading accolades, including hosting Spain’s Federation Cup knockout tennis tie against Paraguay, being voted ‘Europe’s Best Golf Venue’ at the 2017 World Golf Awards and receiving a Golf Digest ‘Editors’ Choice Award for Best International Resorts’ for the second year running. And more honours could be set to follow in the coming months with the resort having been shortlisted for three top awards at the 2018 World Golf Awards, which La Manga Club will host for the second year in a row from November 1-4. The official overseas training base of the Lawn Tennis Association (LTA), the resort’s unrivalled facilities include three 18-hole golf courses, a 28-court tennis centre, a European Cricket Performance Centre and a 2,000sqm Wellness Centre. In addition, it features the choice of a five-star hotel, four-star serviced apartments and townhouses and more than 15 bars and restaurants.